I wrote in last month’s essay a long historical account of why the Catalans decided some years ago to revive the plea for independence from Spain. It all depended on interpretation of what side of the argument Catalan politicians based their demand. In many ways it was a sort of true or false game of historical facts. One common denominator was their refusal to accept the Monarchy as overall ruler, especially a Bourbon. King Felipe VI of Spain is the latest descendent. Instead, their aim was always to declare the new nation as a European Republic. Recent events of the separatist movement have received sufficient worldwide press reports and the final outcome is now well known regarding the recent results that have taken place. No sooner had the Catalan Parliament voted at 15:30 on Wednesday 25th October for a unanimous declaration of independence that the Spanish government presided by Sr. Mariano Rajoy, backed by all the constitutional political parties, immediately invoked the infamous article 155 giving the government full powers to take over the autonomous region that included new regional elections on the 21st of December. A lock, stock and barrel decision! If we just back track to 1934 when the first formal declaration of independence took place that has been used as the main reason during this second campaign, the world panorama was completely different. Fascism was brewing in Germany and Italy, the political scenario in Spain was equally volatile that erupted as a horrendous Civil War followed by WWII. The crash of 1929 caused a great deal of poverty in Europe and Spain was no exception. But what was more relevant as compared to today’s world was the advent of true democracy: modernization, integration, internet and globalization were far in the future. Since 1934, through to the XXI Century, peace in Europe was finally achieved with hundreds of thousands of treaties that bind us together and now comprise the European Union, NATO and above all the consolidation of the United Nations. Catalonia, as a part of Spain enjoys membership of all these institutions. If we add modernization such as telecommunications, infrastructure – roads, railways and airports – social security, including a monumental welfare state, the mere separation process would be awesome. The above is simply a tip of the iceberg of modern life based on freedom that all Spaniards and Catalans enjoy today. 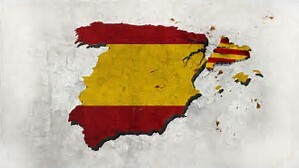 Citizens freedom after the end of the Civil War and during the transition period was achieved thanks to the approval through –ironically – a referendum of a new Spanish Constitution in 1978. It is this very Magna Carta that is now at stake. Expanding probably on my previous essay as a sort of recap. Despite the nation agreeing to bury the hatchet and let bygones be bygones, Catalonia, with its new Parliament in the hands of Jodi Pujol began a program of Catalanization using the ace card; the Catalan language; now accepted as an official Spanish language. Slowly they began moving towards independence by using a second tool at their disposal. Education! Another important political tool. For the past 40 years the school curriculums have slowly changed basically instilling in the new generations that ‘Catalonia is different’. Hence much of today’s youngsters are all for independence. Going back to the events that have now taken place. All depends on whether the law enforcing agents, the district attorneys, the judges, the police and civil guards are able to avoid violence there may be a light at the end of the tunnel. Much is at stake that needs repairing, especially the economy as thousands of companies have moved away from the region and investment is at a standstill. This affects the whole Spanish economy. In a way one could say that Spain is pausing to take a breath and hopefully continue on different route that may instill some common sense into the Catalan people by true democratic arguments before they embark, yet again on a road that belongs to the past century. *To be updated as events unfold.